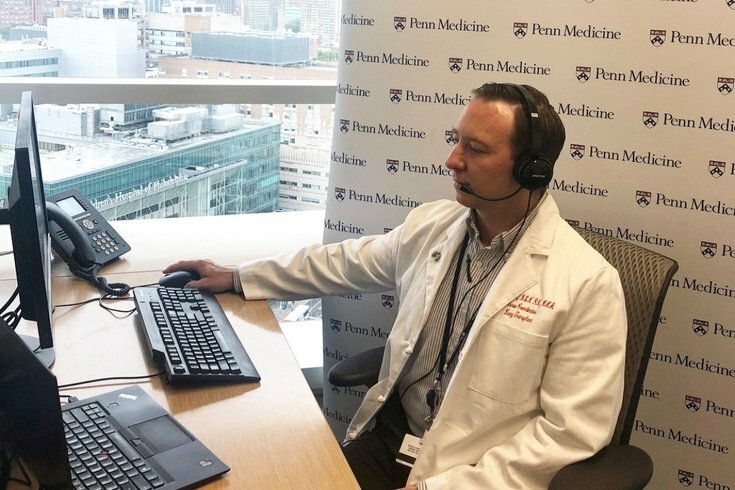 Daniel Miller, a lung transplant nurse coordinator at Penn Medicine, developed an online course that patients and their caregivers can complete to meet a critical requirement to get on the transplant waiting list. Adding one's name to the transplant waiting list requires completing a litany of tasks. At Penn Medicine, lung transplant prospects spend four days undergoing rigorous testing and meeting with various medical professionals. They undergo CT scans, vascular studies, pulmonary tests and bloodwork. They meet with rehab consultants, surgeons and other transplant team members. It's all needed to ensure the patient is a viable transplant candidate. But there's one seemingly easy requirement that can prove a bit challenging for some transplant prospects. Their designated caregivers must complete an educational seminar covering the entire transplant process. "It's so hard to have some people come to these classes," said Daniel Miller, a lung transplant nurse coordinator. "It's during the middle of the day. It's during the middle of the week. Many of our patients come from all over the country, for that matter. So how do they coordinate that?" Previously, patients and their caregivers need to make whatever sacrifice necessary to attend the session, including rearranging schedules and traveling considerable distances. Otherwise, the patient can't get on the waiting list. But Penn Medicine offers lung transplant patients – and their caregivers – an opportunity to take that seminar remotely. Miller launched an online course last October, allowing caregivers to engage with the instructor via videoconferencing technology. "It's the same exact content that we would be teaching in person, only it's over the internet," Miller said. "It's a virtual classroom. We could have up to 30 people in the class." Emil DiPlacido, a chronic obstructive pulmonary disease (COPD) patient in need of a lung transplant, took the course earlier this year alongside his wife, stepson and stepson's fiance. DiPlacido, 56, lives in East Stroudsburg, Monroe County – about two hours away. DiPlacido previously had made the trip to Philadelphia for various tests and consultations. But the virtual class saved his family from spending an entire day on the road. Instead, they took the one-hour class while sitting at the kitchen table. The videoconferencing platform "that can be used very effectively in trying to make things just a little bit more convenient in a process that can be challenging," DiPlacido said. The course packs a wide range of topics into an hour. Participants learn about donor selection, organ allocation, and the benefits and risks of transplants. They also learn about the operation, post-operative routines and post-operative care. The course helped DiPlacido and his family develop a plan for how everyone would respond if he eventually gets a call that an organ is ready for him. "When you go down this road of transplant, it's just part of the process," DiPlacido said. "It's very informative, very educational. I think it's a good opportunity. ... For some patients, who may have a disease in a much later stage, simply getting out of the house and traveling two hours can be a really tough thing to do." The virtual class also offers transplant candidates and their caregivers and opportunity to retake the course – an advantage that revealed itself when patients began taking the class multiple times. Transplant candidates are asked to absorb a lot of information – often all at once, Miller said. Remembering it all can be challenging. "One of the things we've learned is that there are many different times that we need to bring education to the patients," Miller said. "We have learned that the traditional model of education – one time and that's all – is not enough. They require ongoing education. They require multiple reviews of that same information and oftentimes by multiple people." Joan Sehl, 68, of Fleetwood, Berks County, took both the on-site course and virtual class, partly based on her interest in videoconferencing. "Knowing nothing whatsoever about transplantation prior to the course, I was like a sponge absorbing all information," Sehl wrote in an email. "I was able to understand the entire process so much better after the course." But Sehl, who also has COPD and needs a lung transplant, said the sessions helped give her a sense of community. Both online and in-person, she could connect with patients and their caregivers going through the same situation. Eventually, Miller said, Penn Medicine may offer lung transplant patients online courses designed to be taken after the operation. "After a transplant, there is another step in that education where we teach them more about their home routine," Miller said. "That's typically done while they're in the hospital. To get some of their support team members involved, it might be an opportunity to conduct this once a month (online)."